When ripping narrow strips or cutting a rabbet along the edge of a workpiece, it's sometimes hard to keep the board flat against the saw table. And if you use the featherboard, it can get in the way. 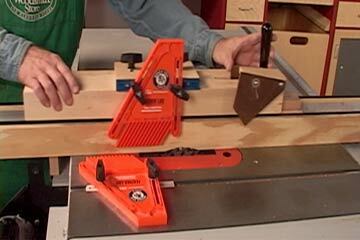 The handy sliding hold-down jig in ShopNotes No. 96 solves these problems.